By Susan Waughtal on November 10, 2010 Visit Susan's Website. 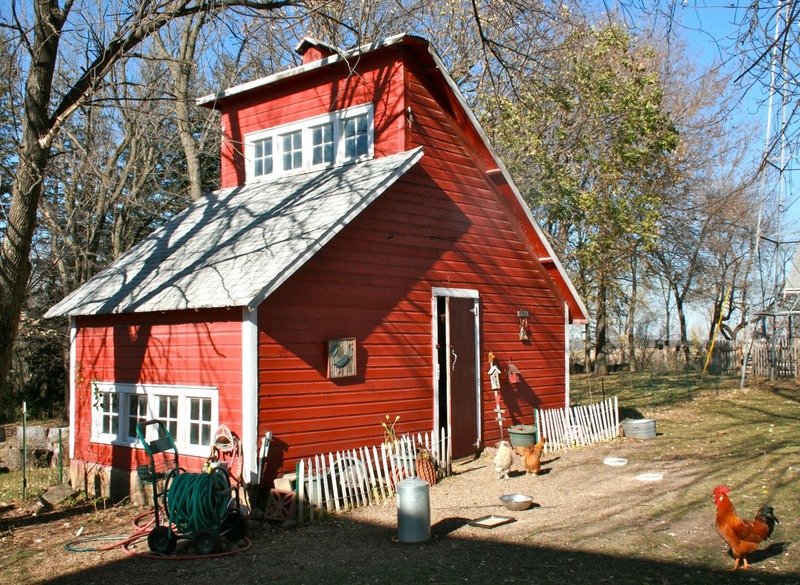 Our little turn-of-the century farmstead has a classic set of red outbuildings. The date embossed on its cupola proclaims the barn was built in 1918, probably the same year they built the chicken coop, my favorite structure of the farm. We have lived here two years now, and I am continually impressed by the cleverness of the farmers laying out the buildings and the quality of their craftsmanship. The chicken coop is no exception. It hadn’t housed any chickens in 20 years or more when we moved here, but was still in great shape. The coop is 12 x 20 feet in size with a row of low, square windows on the south-facing side. The northern half of the building juts above the shorter southern half, with another row of south-facing clerestory windows that bounce light into the building. The height of the tall peak, topped by a tiny cupola, makes for great air circulation. There are also three tall windows on the west side. The thoughtful placement of the windows provides maximum solar gain in the winter; a maple tree on the southwest corner shades the coop during summer. We started with just nine laying hens and a rooster, so we built a wall down the middle of the building and gave the chickens the shorter, sunnier half of the coop. (I used the other half as a potting shed.) The sun streams into this room all day and the chickens enjoy the warm sunshine. When it is hot, the windows can be slid up to open. 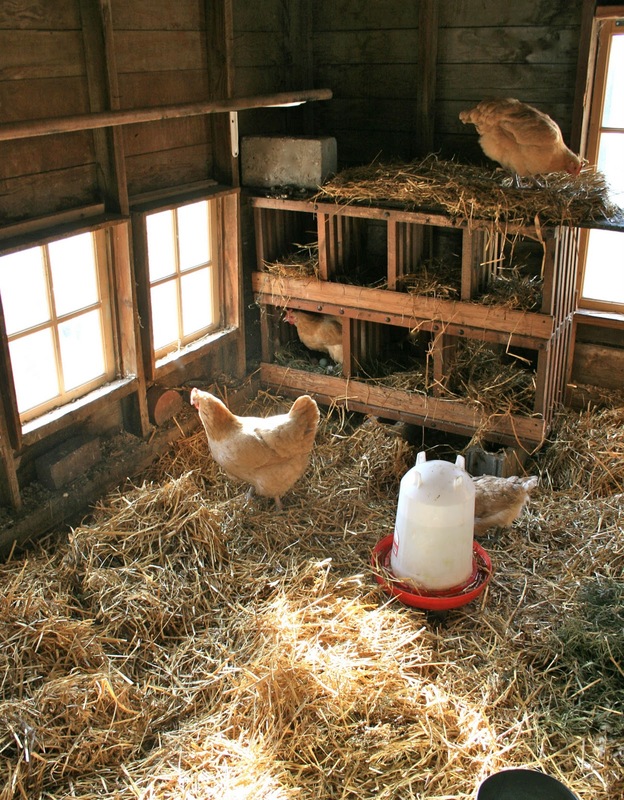 The chickens love scratching through the deep straw bedding on top of the concrete floor. My potting shed got smaller when we added another wall (constructed from old closet doors) to create a chick-raising room in the middle of the coop. I stapled plastic fencing across the back and corners so chicks can’t bunch up in a corner or get stuck in a cranny. 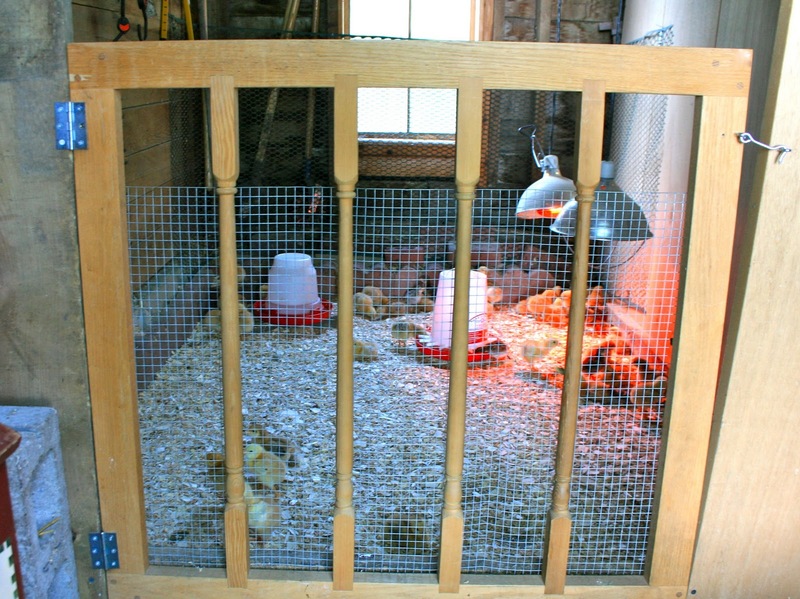 An old stairway gate with hardware cloth stretched over it allows me easy access and lets the chicks and adult chickens get to know each other. I’m committed to recycling and repurposing, so I am always on the lookout for used stuff that can be adapted for the chicken coop. A sturdy, rustic bookshelf from a thrift store, flipped sideways, became nesting boxes. 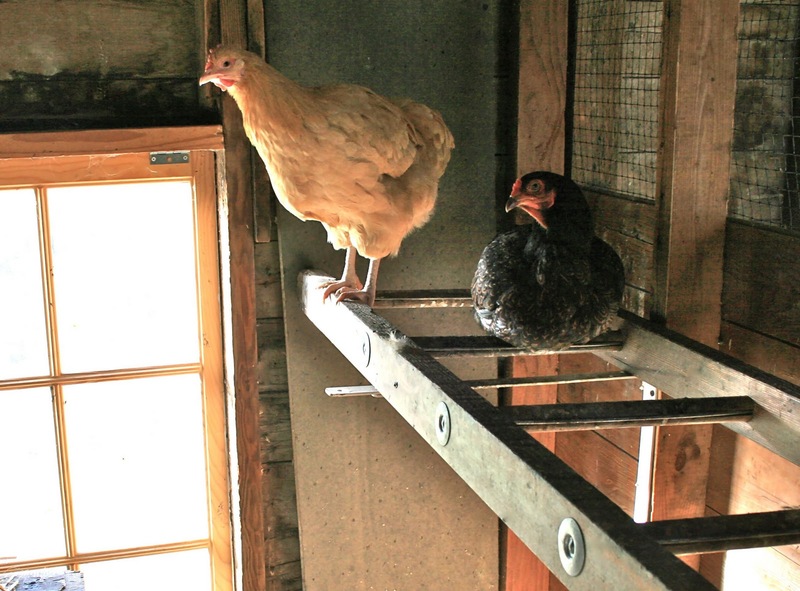 A garage sale yielded an old 8-foot wooden ladder that is the favored roost. As many as 24 hens snuggle here together at night. The ladder is supported by sturdy metal shelf brackets, and secured by a twist of vinyl coated wire so it is easy to take down the ladder to power wash it during spring cleaning. Old stairway handrails provide additional perches. I installed them at various heights, but all the hens preferred to be up high, so I moved them all to my shoulder-level, where I can still nab a chicken if I need to. The hens manage to get their offspring up onto the perch at a very young age!Our laying hen population increased to about 50 this summer (those darn broody hens! ), so last week I moved my garden gear out and installed some more roosts. The chickens have taken over the entire coop. 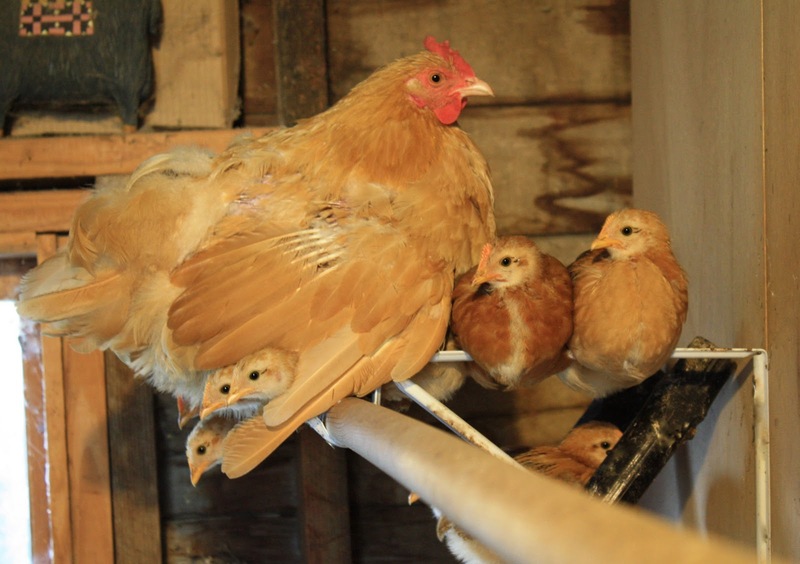 Absolutely love that pic of mama hen and her babies up on the perch! Saw your pictures on your blog and was wondering if I could use one on my business card. Thanks for all the nice comments about our chicken coop. I feel extremely lucky to benefit from all the savvy planning by the original owner of this farm 100 years ago. I hated to lose my lovely potting shed area, where i could commune with the chickens, but I am claiming a section of the barn to be my new garden storage area – and expect someday i will find a little shed on Craigslist for sale to turn into a dedicated potting shed. Love all your recycling ideas! I’m curious about the old bathtubs. I beleive you have the ultimate chicken house in many respects; optimal lighting for direct sun as well as refraction, lots of space, and well laid out. I have space problems due to the traditioal pole roosting construction. It never occurred to me that ladders situated as you have yours, could solve my problem and I have four hard wood ladders that I never use because they are so heavy. Thanks for the great idea. I have fourteen Gold Buff Orpington hens and a rooster. I got them as chicks on May 14. They are presently laying 11 to 14 eggs per day.I’m amazed at their performance, however, I expect the production of eggs will decline with winter approaching. 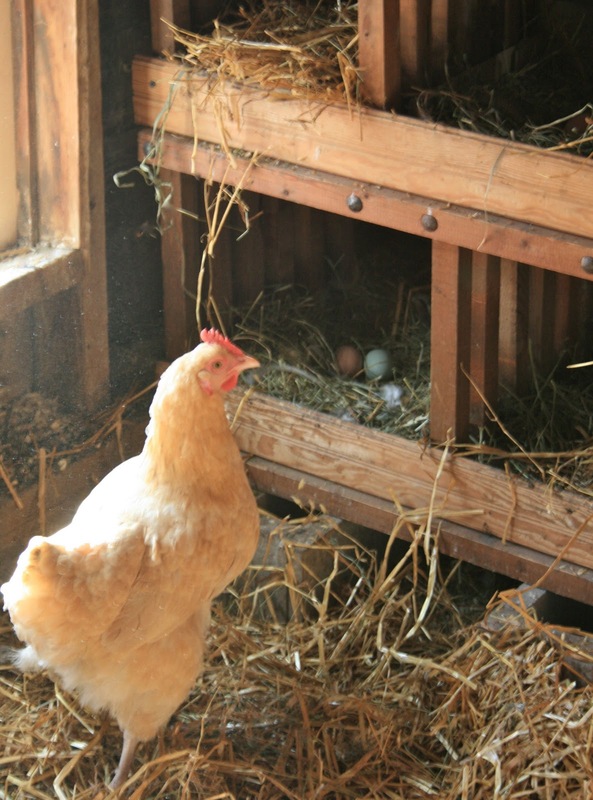 I do believe the light bulb in my coop keeps them warm, encourages them to eat more, and I usually find four to six eggs early each morning when I provide additional feed and water. I expect to be busy this spring because the Orpington is so prone to broodiness and several covet the eggs already. Thanks again. Susan, that is the most beautiful chicken house. I thing you have done a beautiful job of raising your flock and sharing the space. What a whiz recycling those things. I believe everyone should recycle. My things are old bathtubs. But this was great. loved your recycling ideas. We did the same as I was laid off right after getting my chicks. I scrounged at a local school that was being torn down and repurposed a mop handle as a roost, milk crates as nesting boxes for the bantams and larger white plastic storage boxes someone had placed on the curb as boxes for the larger hens, I also used a door, placed on cement blocks and then an empty bookcase on top of that (it came w/o shelves) as the starting point for our nesting area so it is up on a raised platform and I placed the nesting boxes facing different directions on top of one another to give the hens some seclusion to “hide out” and lay. We also repurposed a broken easel into a walking ramp into the coop itself. The support structure of our coop was made with the old wood from tearing down our deck. The only thing we bought was heavy gauge wire for screening and 8X4 support posts and corrogated steel for the roof. Gorgeous! Thanks for sharing. I am also very impressed with your reclycling efforts. Bravo! certainly incorporated some very innovative ideas. (makes me want to build a new one). I’ve never thought of using clerestory windows in a structure for my chix, but now you have started the gears turning in my head. We recycle/reuse as much as we can, but the book shelf idea was vert clever. I really enjoyed your article and thanks for the great pics as well! Thanks for the wonderful recycling ideas. We are just getting ready to start with chickens in the spring and do enjoy readers like you and your helpful comments. Beautiful chicken house. Sorry about your potting shed – I would miss that part dearly. What a beautiful shed. Great pics and nice story besides. I really enjoyed your article and am so envious of your BEAUTIFUL coop! I especially appreciate all the items that you have recycled, as I love to find uses for salvaged things, too. The nesting boxes are just the best!